Are you looking to gain more exposure to your website or gain more followers? Need to increase traffic or clicks on your page? Here on Onyx Sims I offer you a couple of options and ways to do just that. If you are interested in my free advertising program, please continue to read on. This process is pretty straight forward and simple to do. There are a few advertising options you can choose from and the only thing you need to do in return is provide a link back to my website. Display your link with a short description in the 'network' section of Onyx Sims. A simple link at the bottom of the network section of the site. Copy the appropriate linking code 'Option A' provided and paste it into the coding of your website for visitors to see. Banner and text display in the 'network section' of Onyx Sims. I will post any 88x31 banner of your choosing on my 'network' section to appear in the secondary section of the network page along with a short description. Copy the appropriate linking code 'Option B' provided and paste it into the coding of your website for visitors to see. An ad banner on the Onyx Sims' main page. Not only will I post any 88x31 banner of your choosing on my 'network' section to appear in the secondary section of the network page along with a short description, you will also have a banner on the main page. So it will always be on display no matter what section of the site viewers go to. Copy the appropriate linking code 'Option C' provided and paste it into the coding of your website for visitors to see. My banner must appear on your main page and network page as well. If you are interesting in this opportunity to advertise your website please contact me via my email below. Onyx Sims -at- hotmail.com with the subject line "Advertising on Onyx Sims"
If you don't have a banner code please please provide a link to where the banner can be downloaded from. Please ask any questions below pertaining to the site and I will answer and archive them here. This is a new mesh for male toddlers. It is a cardigan layered on top of a polo to give your toddler a fashionable casual look. It comes with 3 presets and all have 4 channels. One preset is a plain cardigan whose buttons have its own separate channel. While the other two presets have a Polo emblem that can be recolored. You may use my meshes to recolor but please give a link back for credit. 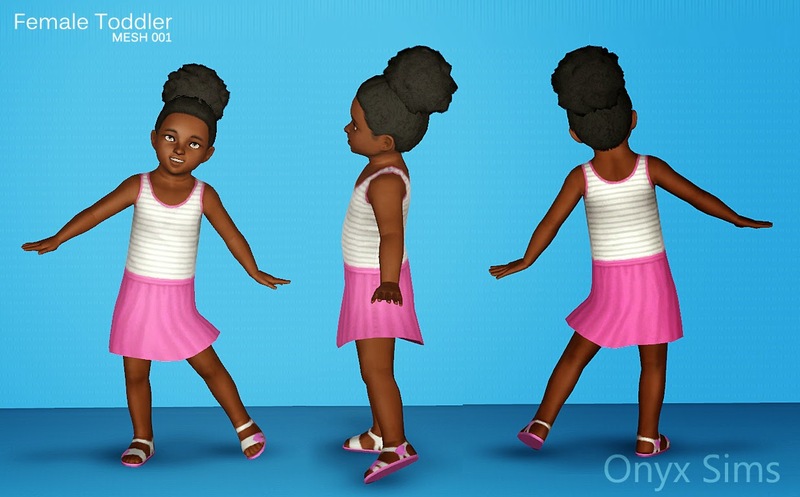 This is a dress mesh for female toddlers categorized for all three enabled clothing categories for this age group. You are free to use my meshes for recolors but please do not steal meshes and claim as your own. Always link back and give credit for the original mesh as well.